Danbury prison transfer: Bureau of Prisons suspends Alabama move for real-life Orange Is the New Black inmates. 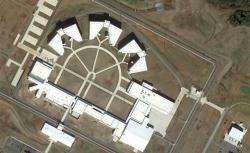 The corrections facility near Aliceville, Ala. The Federal Bureau of Prisons on Wednesday temporarily suspended the transfer of more than 1,000 female prisoners from their current housing at a prison in Danbury, Conn., to a new prison in Aliceville, Ala.
Last month, Slate published a piece by Yale law professor Judith Resnik denouncing the transfer, which left only 200 spots for women serving federal prison sentences throughout the entire Northeast. (Those beds are in a separate low-security camp in Danbury.) The Aliceville facility, which cost $250 million to build, would have moved most of the women hundreds of miles from their families. Eleven senators from the Northeast signed a letter on Aug. 2 objecting to the move. Most of the women doing time in Danbury are there for nonviolent crimes. Arduous and costly as they could be, these visits were a necessity: they kept families connected to their incarcerated mothers, sisters, wives, daughters and fiancées, and kept prisoners connected to the outside world — one of the most important factors in determining whether they would return home successfully and go on to lead law-abiding lives. All true, which brings us to the next challenge: Now that we have the Senate’s and the Bureau of Prison’s attention (plus a little TV celebrity), let’s get prison officials to think about all the ways in which it can help foster ties between children and their incarcerated parents, both mothers and fathers. “The Department of Justice and its partners in the federal government are committed to helping children of incarcerated parents live happy, productive lives,” according to its website. OK—time to make that promise come alive. The Bureau of Prisons should let the women of Danbury stay there permanently and keep the facility open to female inmates who come after them. It should take the location of children into account when deciding where to house all prisoners with families. And Congress should stop approving money to build prisons in remote locations. There’s no train station or airport near Aliceville. For the men who will now go there in the women’s stead, how about money for their kids to visit by bus?